Oh my, what a day we had yesterday. 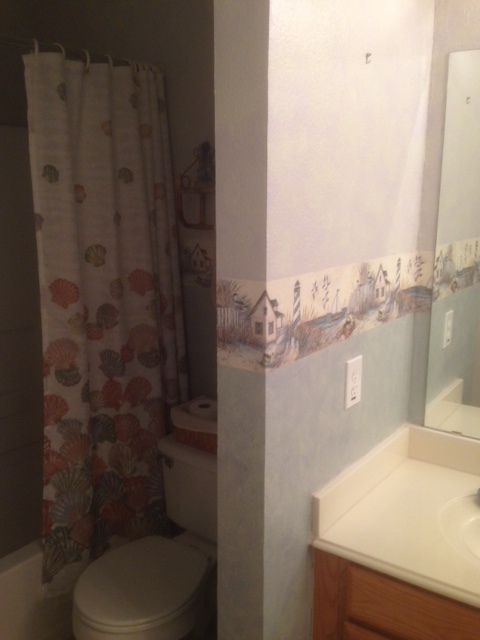 Did I tell you we’re having our bathrooms and laundry room updated as well as the kitchen? No? Well, we are, and the fun began with a bang yesterday. Err, make that a lot of bangs, growling saw blades and mess. Big time mess! 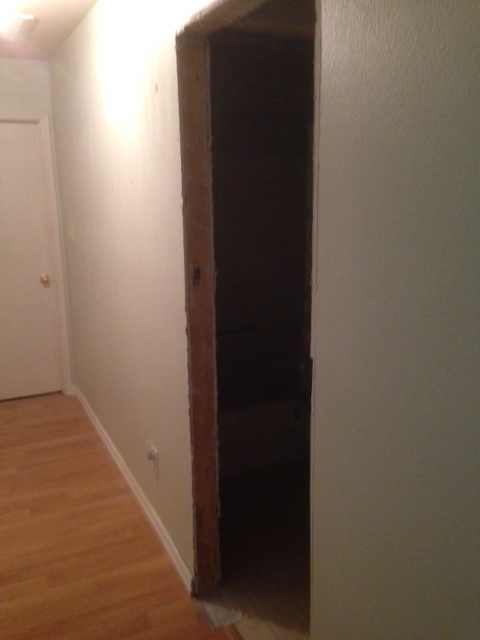 Newly cut, wider doorway, waiting for new door and frame; wood floor in the hallway also must be repaired. 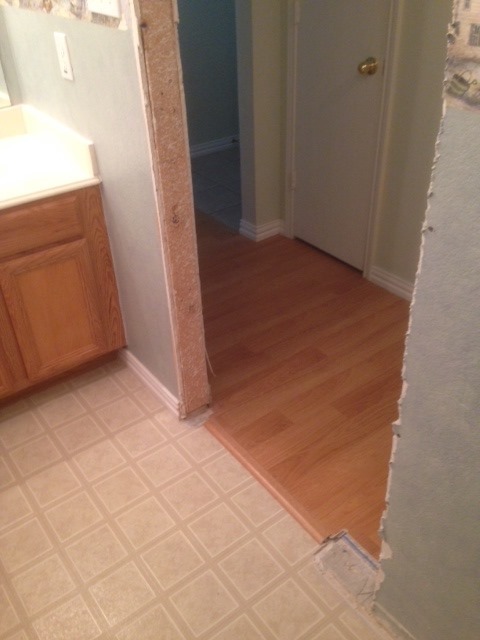 Luckily, we have a few extra boards left from when the floor was installed. Divider wall also had to be cut back a few inches. I’m losing my pretty seaside wallpaper border. Darn! 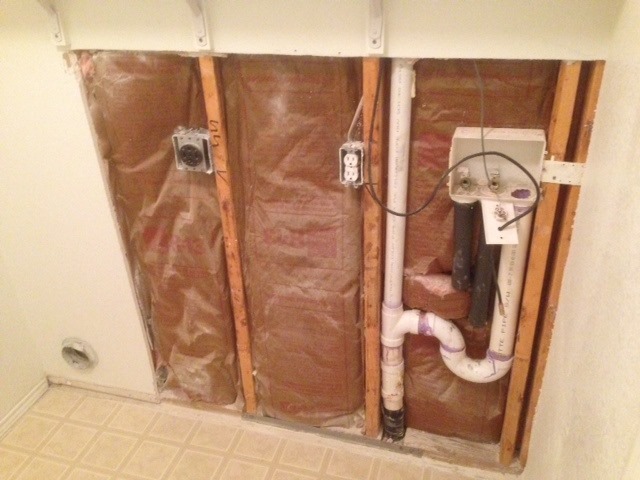 Next came the laundry room, where the plumbing needs to be rearranged to accommodate our new washer. We had an old top loader before, which worked fine with the placement of the water and drain pipes. 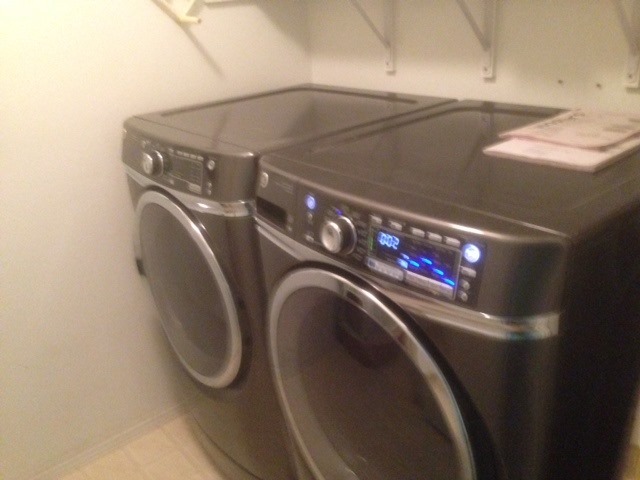 But the new one is a front loader, as is the dryer, and in their present position the doors open against each other, making it difficult to switch clothes from the washer to the dryer. With my unsteady balance this is a real problem. Thus, we’re having the water and drain lines moved so we can switch the washer and dryer. Pretty new babies need switching; wall opened up, showing water line that needs to be moved over, happening today. I wonder when the wall will be put back together. I can’t wash clothes until this and the new floor tiles are done. Hubby and I foresee a trip to a laundromat in the near future. It’s been years since we visited one, but I remember it being a weekly stop back in the day, when we were newlyweds. A century or two ago. This only the beginning. Next week the kitchen demo starts. Oh joy! I hope all the dust from this doesn’t make your respiratory problem worse. You might be smart to stay elsewhere if it does. Looks like you are doing some worthwhile projects. Rain, I’m worried about that too. There was dust flying around on Wednesday, when the workers were cutting through plaster and wood, enlarging the bathroom doorway. 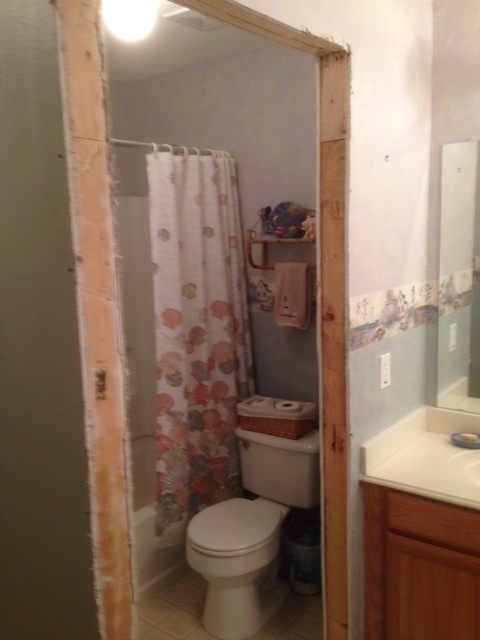 More of that to come next week when they start tearing up the other bathroom. I’m thinking about wearing a mask to keep out the worst of the dust particles. Chaos is a good word for it, MT. And it’s going to get worse before it gets better. It will be worth it in the end, I guess. I’m sure it will be but there may be times when you have to hold onto that thought… Not too many though, I hope.